Mint condition, 98%+ with only some very slight strap changing marks on the underside of the lugs. 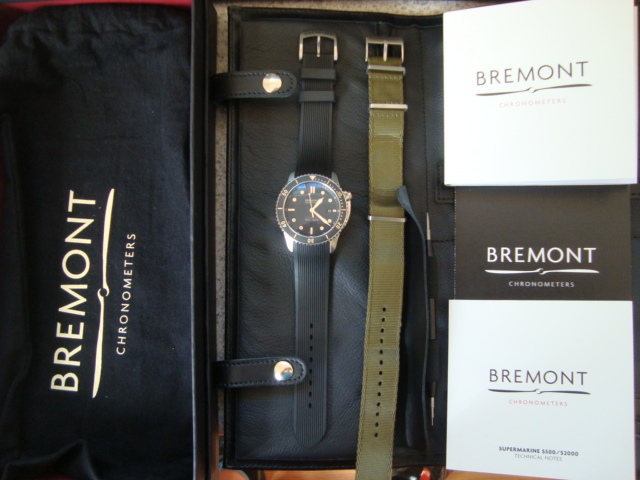 Purchased new from an AD this year, it carries the remainder of the full warranty from Bremont. A beautifully made diver, the 501 is the bigger brother of the line and a hefty, capable diver's watch. Comes with the full kit, plus a bonus nylon Bremont strap that runs about $200. The rubber strap is supremely comfortable. Lots of photos available to serious buyers. No trades please. CONUS only. Payment via PP. Insured, Priority Mail shipping included. Longtime seller on multiple forums with excellent feedback. Retail is $4775.00. Asking $2975.00. Stainless steel Bremont Trip-Tick® case construction with scratch resistant DLC treated case barrel. Protective patented anti-shock movement mount. Sapphire uni-directional rotating bezel with Super-LumiNova® luminous coating. Case diameter 43mm. Overall height 16mm. Strap lug width 22mm. Stainless steel case back with integrated flat crystal.